First off, attached is the scanned instructions for the HKS V-mount intercooler. I have not seen this document online somewhere and it's a Good Thing to have it somewhere for posterity. 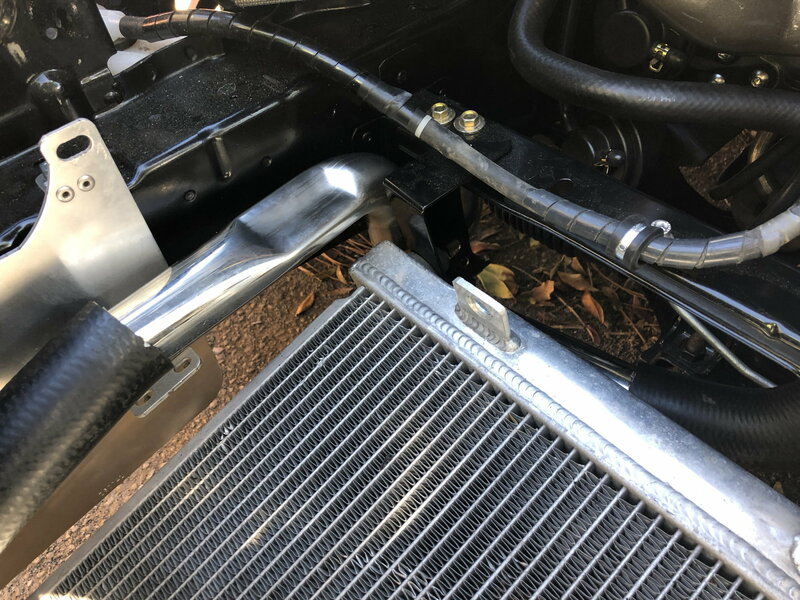 So, some first impressions, notes, and thoughts on this intercooler kit. My buddy Jon just bought this for his car, we are sloooowly building a rolling chassis back into a full, nice FD again. This is quite reasonably priced now, RHD Japan has it for just over $2000. It was around $200 for shipping, but that's hard to say because he got a few other parts from them as well. This is a heckuva good price for the quality of this kit. The kit includes the intercooler itself, a bespoke throttle body elbow, piping, tons of nice brackets, and all the bolts and bits you need. The brackets are SUPER well made, very sturdy and quality. The kit is designed to use a stock-style radiator, it doesn't come with its own radiator. There are pros and cons here, the BIG pro is if something happens to the radiator you can simply buy another new Koyo or whatever and install it. You're not out an exotic JDM-made bespoke radiator. The downside is the drain plug is in the wrong place and it's a little odd. It does have VERY nice formed metal pipes to run the coolant from the radiator to the engine. You trim your stock radiator hoses to join the metal pipes to the radiator and engine. The kit has brackets that bolt the radiator fans to the *back side* of the radiator. The kit has a good range of thickness adjustment for these brackets so they will accommodate a stock radiator or a thick aftermarket one. On first whack the brackets fit a Koyo just fine. The kit is designed to keep AC. Of course it's designed around the Nippondenso AC system, it has very nice brackets for the condenser to bolt up to. It does include new hard lines to accommodate for the move of the condenser, however they DO NOT seem to work with US parts at first whack. I have a spare Nippondenso drier and the line that is supposed to attach to the drier won't fit, the end that goes into the drier is too big to go into the hole. There may be a difference with the JDM driers or a difference with R-134a driers. 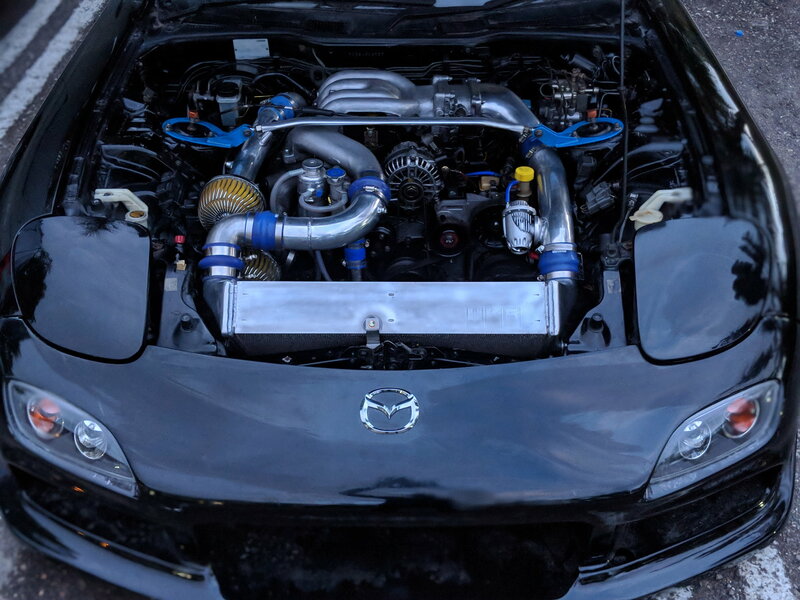 The kit is designed to be used with the HKS RS intake, but whatever intake you run will need to be pushed to the side as the IC takes up quite a bit of room up front. There is a nice, heavy gauge bracket that sits in front of the motor that holds the fuse block(s) and a small battery. The instructions call for a 38B19R battery, after doing some digging it looks like in the US it's called a 151R battery and is a stock 12v battery for the 04-06 Honda Insight. It's quite small (think Miata battery). 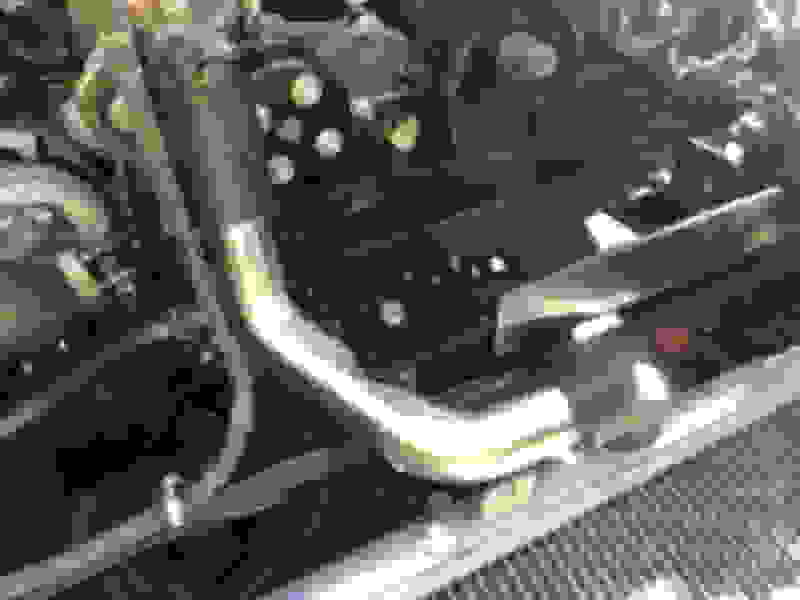 The PS cooling loop is removed and sort-of bypassed with a long piece of hose. Personally I would get a small auto trans cooler and plumb that in for the PS cooler. Since the kit was made for a RHD car I think the method of hooking up that cooling loop is moot on a LHD car. The nuts and bolts with the kit are all stainless metric hardware but the quality is OK. Instead of bolts with floating washers or flange heads they are kind of hardware store-grade bolts and they want you to use a lock washer and flat washer with each bolt. It would have been nice to have more JDM OEM-grade bolts, but whatever. We have a long way to go before the kit is permanently installed, and even longer before we're starting the car for the first time. I'm leaning toward using an RX-8 AC condenser since it has a built-in receiver/drier and the whole thing is like $80 brand new. I'll update this thread as I find more down the road. Big thing is doing some documentation on this for the future. Also, I have a copy I made of the manual that I marked up after using Google Translate to translate it to English . Most of the instructions are pretty straightforward though and don't really need translation. Thatâ€™s awesome, 2k for essentially a bolt on v-mount is a bargain, and from HKS too. Iâ€™ve got a RHD so this would probably be even easier to fit... tempting. Thanks for the review and insight as always Dale. I'll keep this in mind when I eventually go single turbo and large IC. Dont' forget to share pics of the install process and final setup. - The kit has 2 very solid plates that bolt to the frame rails on either side, top and bottom. Everything attaches to these - the radiator, condenser, and intercooler. There's also an adjustable splitter panel that goes between the IC and radiator to equally duct air to each. - The side plates have 3 brackets riveted on for the AC condenser to bolt to. It is designed for the JDM Nippondenso AC system, but after looking at it it could be modified for the US MANA AC system. The rivets could be drilled out and the brackets moved to the appropriate locations and riveted back on. There's no WAY you will install the kit without discharging the AC system, one of the AC lines goes through the side panel and you have to flip it over so far you'd never accomplish that without destroying the lines. Unfortunately it's going to be a bit before I tear into it again since I'll be going out of town for Thanksgiving, but I'll be back at it . I recall reading a few posts from over a decade ago that mention the radiator is very low to the ground with this kit and a thicker radiator, but I am curious whether they ever updated the kit to correct this. We are slowly getting there with this kit. It does accommodate a Koyo with the clamps that go around it just fine - it is adjustable for radiator thickness. The fans are pretty low with the kit, but I'm not sure yet HOW low, we don't have the belly pan yet and are waiting on brackets to come back from powder coating right now to start really putting things together. The good side/bad side of the kit is using a standard radiator. If you need to replace the radiator it's no big deal as far as getting the part, but there's a lot of compromises to do so - it's kind of odd how the radiator mounts and the fans are on the low side. Everything else in the kit is top notch, the brackets are super nice, the radiator is gorgeous, nice throttle body elbow, etc. Thanks for the update, very helpful. Looking forward to seeing how it all fits up. Getting closer and closer to being DONE with this install and having a running car. - Prepare to do some semi-minor wiring work. The fan wires need to be lengthened a good bit. Also, since the positive battery terminal moves a good amount to the small battery in the battery bracket, some of the wires going to the fuse box on the positive terminal will need to be extended. In theory you could leave the fuse box over to the side somewhere and just run a thick cable to the positive terminal but that's a lot of places for potential failure. Also, there's a decent size (12 gauge?) wire going from that fuse block to the other underhood fuse box that's WAY too long since they are located right next to each other. I'm going to make a replacement wire that's much shorter. - Same goes for the negative battery terminal's ground to the chassis, the bracket it originally attaches to is no longer there. You have to get a little creative. - You really have to study the pictures in the manual to figure out how to run the pipes for the radiator. Also, since you have to cut up a stock radiator hose for the connections, the hose should be a new-ish hose. An older hose has expanded some so it won't fit tight on the ends. Soooo.. i have this kit and im Keeping the AC . What do i need or not need to do this? We have the instructions in English on our site. Dale I replaced the oem fans with single speed fans from spal 1470 cfm each. Low profile fans bolted on the radiator thru the radiator fins and a half condenser from HPI. I would like to put the oem fans back and perhaps use the rx8 condenser. My ac is ok but ok it could have been better..
Last edited by R-R-Rx7; 07-28-18 at 06:54 PM. Curious Why back to the OEM Fans? i Bought this Kit second Hand and it came with Dual Spal Fans as well. I've been told the RX-8 Condensor is the way to go but not sure why either. i have been using the HPI half condenser.. AC is not cool enough.. i do feel that the oem (99spec fans) are far superior than the spal ones that i have. Perhaps some ducting/shroud might help this issue..
i also like the multispeed option that you cant have on this setup..
car runs cool dont get me wrong. Track days at 100+ F degrees ambient temps and no issues... yet again my AC is weak ..
Last edited by R-R-Rx7; 07-30-18 at 08:49 PM. Use the RX8 motors and blades with the OEM RX7 shroud. These pull more air than any of the OEM RX7 fans, are quieter, and use less amps. Here is the thread in this section where we have been having a discussion about these fans. That may be true for later model RX7's, if you have one.. I am talking about USDM '93-'95 models. The motors may be the same or similar but the fan blades are definitely different. The size and number of blades is different. The RX8 blades do not fit on the OEM USDM RX7 motors. The fan noise is quieter and the amperage draw is less. Also, a full shroud on a radiator makes a difference in cooling effectiveness since it forces or draws all of the air from the radiator through the fans and therefore the heat exchange is improved particularly stopped or at low speed. At higher speed the effectiveness is obviously less significant. purchased this kit. My car is Rhd so hoping the intsall will be simple. I have a SARD oem position radiator so im glad to be able to retain that. My car is 97 so i assume i have the better fans? hope they dont hang too low. Will update when it finally comes. Dumb question here. Does this kit retain the stock OEM front undertray, or is that removed? Finally got everything up and running . I have a busy schedule and did a few bits and bobs every day before going to work. Having English instructions made this a breeze. I got my kit used with a few things missing. No ac lines or battery / harness brackets and the hot side pipe was designed for a single turbo. But for the price I got it for it was worth it. Relocated the battery to the trunk and made my own fuse box mount and Ast mount . Bent a few a/c lines and made a loop for everything to work. Fans are low but not rediculous. The kit is absolutely beautiful and so happy to have it. how high off the ground are the fans? Do they scrape on speed bumps?